Supported by a steel frame, the top is angled away from the user to give a slimline aesthetic. This provides improved ergonomics as well as accentuating the visually light horizontal structure. Tables up to two meters long are supported on four removable legs positioned at the extreme corners of the table. Maximising the knee space making a simple visual link between tables when pushed together. This detail enables tables to be configured together very simply without complex interlocking systems. 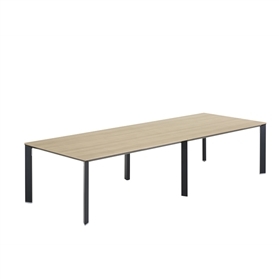 Ideal for numerous applications such as seminar rooms, conferencing, boardrooms and training rooms as the tables can be easily dismounted and stored. Further enhancing Senator’s conference table offering. Note: Tops are provided in two pieces.